The Taylor 110 Left-Handed Dreadnought knocks other left-handed dreadnoughts out of the ballpark with its awesome visual appeal and a tone so crisp you can almost taste it. You have to hand it to Taylor; they make some of the best acoustic guitars available, and are known for their quality of construction as well as their rich, throaty sound. And it must be said that they certainly didn’t skimp on either quality or sound when they crafted the 110. Made with a solid Sitka spruce top and sapele back and sides, this beautiful piece is definitely an eye-catcher, but it doesn’t stop with pure visual appeal. 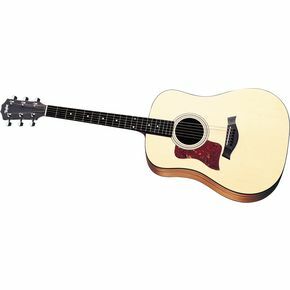 The Taylor 110 left-handed dreadnought also produces an open, airy tone that is at once light enough and rich enough to appeal to any player’s tastes, and which responds awesomely well to both flat picking and heavy strumming. As a dreadnought it is rather deep of body and wide of shoulder, a fact which may make it difficult to handle for younger or more slightly built players. But the richness of its sound combined with its visual appeal make this a guitar one that you won’t want to miss if you get the chance. So, if you want a quality left-handed instrument at a fraction of what others would charge (only $599, including the Taylor gig bag) you might want to consider the Taylor 110 Left-Handed Dreadnought.